Season Nine of The Walking Dead Is Going to Be a Glorious Catastrophe, Isn’t It? If you happen to be a die-hard fan of AMC’s The Walking Dead—assuming that such a thing still exists after eight full seasons of the show pretty much steadily devolving from its 2010 pilot episode—then the last week has basically amounted to theater of the absurd. … Well, wait just a minute. As it turns out, Maggie (Lauren Cohan) isn’t long for this world on The Walking Dead, either, after being a main fixture of the narrative ever since Season Two back in 2011. And even more incredibly, she’ll also be leaving the series after only six episodes, in exactly the same manner as Lincoln, except she’ll be doing so in order to pick up a starring role in ABC’s new series Whiskey Cavalier, playing a “feisty” CIA agent. You can enjoy that thoroughly pedantic trailer below. At least the money is probably good, right? More than anything, it’s incredible to think that AMC not only allowed this to happen with their cash cow, a show that previously achieved the highest TV ratings in cable history, but also allowed the news to become public and widespread so long before the season even begins. Think about it: The first episodes of Season Nine don’t air for roughly five months, and we’ve already been informed not only that the two most important characters are leaving the series, but exactly how many episodes they’ll be in before they do. I can’t think of any similar precedent in primetime TV history—I mean, really, how many times have we found out five months in advance exactly when a character will die on Game of Thrones? Do you think you’ll know about Jon Snow’s last episode, 150 days before it airs? I don’t think so, folks, if only because HBO would never let that happen. Not only that, but think of how badly this information will hurt any dramatic potential that might be left in the departure of these characters. It’s as if the entire sequence of events was designed in advance in order to scrub any semblance of suspense from Season Nine—they might as well start advertising it as “the season where Rick dies,” just to take advantage of the ubiquity of the information. Then there’s the odd positioning of those two character departures within the frame of the season itself. Both are reportedly appearing in six episodes, which might initially make you think “so they’ll get killed off in the mid-season finale,” except for the fact that Walking Dead seasons have always been 16 episodes long. So what does this mean? The main character of the series dies six episodes into Season Nine, subverting the TWD trope that important events can only happen in mid-season and season finale episodes? Or does it perhaps mean that two episodes of the first half of the season will take place in an entirely different locale, away from both Rick (in Alexandria) and Maggie (in The Hilltop)? Regardless, there’s no way that the two of them make it past the mid-season finale, which begs the most obvious question: What the hell do you do for the second half of Season Nine? It’s already been widely reported that AMC is making some kind of huge monetary offer to Norman Reedus in order to make Daryl Dixon the de facto “main character” of future episodes, which would certainly imply additional episodes after the end of the ninth season. But Daryl? Really? If you hadn’t watched any of The Walking Dead since Season Two, that might seem like good news to you. Back then, Daryl Dixon was the show’s most popular breakout character, and for good reason. Intriguingly characterized through his adversarial (but grudgingly familial) relationship with his psychotic, racist brother Merle, he was a figure fans could empathize with and rally around. But whatever interest once existed in Daryl has been slowly ground away over the last six seasons, reducing him to a largely silent, squinting, occasionally grunting soldier who has barely spoken in complete sentences since the end of Season Four. The goodwill that existed for his character is long since gone, and AMC should realize this. Even Norman Reedus would probably rather make more episodes of his motorcycle show than have to carry The Walking Dead for multiple seasons. This is why the departure of Lauren Cohan hurts that much more. 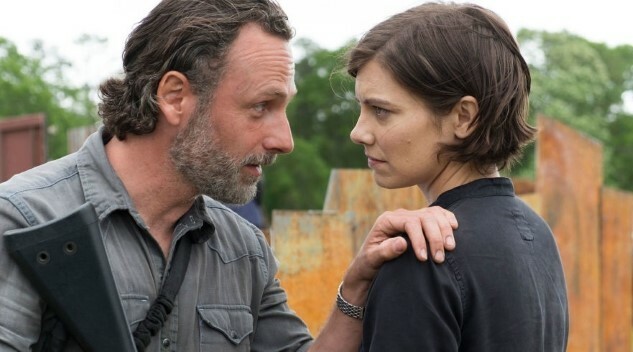 If there was one character on The Walking Dead who legitimately seemed to be receiving grooming to be the new main character in Rick’s absence, it was Maggie. Still carrying the baby of good old Glenn through what has been a very long and stressful pregnancy, her impending motherhood marked a clear impetus to transition from “fighter” to leader and strategist. In fact, one of the only threads of the entire Negan storyline that critics (ourselves included) seemed to enjoy was the slow rise of Maggie from another member of the Grimes Gang to the de facto leader of The Hilltop after ousting the uniquely pathetic Gregory. The eighth season even ends with a (patently ridiculous) tease that Maggie, Daryl and Jesus (nice guy Jesus, of all people!) might be somehow plotting against Rick, bitter and resentful that his plan was to spare Negan after the war. Is AMC really planning to pay off that seedling of future plot in only six episodes? Does the first half of The Walking Dead Season Nine build up to Rick and Maggie killing each other for no good reason, after 100-plus episodes of being allies? Followed by a show where Daryl grunts and scowls his way through an additional eight episodes while battling an entirely different adversary? All of these things are complicated by the myriad unresolved threads that the show introduced during the second half of its eighth season. There’s “Georgie,” the mysteriously well-to-do woman who shows up out of nowhere and hands Maggie a book of engineering and farming know-how that is treated as a holy grail, despite the fact that this same information is probably available at any post-apocalypse branch library. There’s the unexplained helicopters flying around the Virginia countryside, implying the existence of a well-outfitted community that can afford to waste fuel on helicopter joyriding. And then there’s everything involved with Jadis, the former leader of the Trash People, who for some reason knows the provenance of the helicopters and how to signal them, for reasons we don’t understand. Is the show even planning on picking back up with those threads at this point, or will they all be thrown to the wind by the impending departures of Lincoln and Cohan? Or will they only crop back up in the series after those two main characters depart? No matter what happens, it seems safe to say that the show is in for a bizarre ninth season. In a now-deleted Instagram post, regular Walking Dead director Michael E. Satrazemis confirmed Lincoln’s departure and rushed to the show’s defense, saying that it will “be different, but it will still be great.” All I can say to this is that I know plenty of Walking Dead viewers who would take issue with the way that “still great” implies the show has been good for the last three seasons. And that, of course, is the elephant in the room: The Walking Dead already had plenty of problems before the news broke of Lincoln and Cohan’s upcoming departures. The entire Negan storyline, adored by fans as one of the most captivating arcs of the original comics, never quite gelled into coherence on TV, bogged down by poorly shot gun battles, suffocating plot armor and endless padding. The ratings reflected the audience’s restlessness, as Season Eight viewership plummeted even as the plot headed toward what was meant to be one of its biggest crescendos. It’s understandable why someone like Andrew Lincoln would look at what was unfolding and want out, even if doing so may very well mean the death of the series that revolved around him. It begs the question of how much responsibility an actor should feel to make his exit from a series logical and satisfying for the fanbase that has sustained his career. Because to be honest, if The Walking Dead was preparing for a bit of finality so important as the death or departure of Rick Grimes, there’s one obvious thing it should have done: Put that death at the end of Season Eight. For all of the declining ratings and narrative problems the Negan arc was plagued by, it at least had an air of finality for the characters. It was, in other words, a natural stopping point for the story of Rick Grimes. It might not have been great, but it would have MADE SENSE. It almost seems ridiculous to say, but you could honestly have done a lot worse than this as an ending for Rick. You know what’s not a natural way to leave? Ending a huge arc, returning for six episodes while introducing new elements, and then departing, midway through a season. While taking the second most important character on the show along with you. Leaving the narrative in the hands of a character who doesn’t speak. Season Nine of The Walking Dead is going to be the most chaotic of messes. And as much as it pains me to say it, I’ll be there for it. I’ve watched this show from the night it first premiered; I’ve reviewed it for Paste; and I’m not about to stop now. Lord help me, I’ll be going down with this ship. As for the rest of you, I’ll wave to you as we sink under the waves. Jim Vorel is a Paste staff writer and resident horror geek. You can follow him on Twitter.